My name is Joe Carrieri , In January of 2007 when I was 16 I was diagnosed with stage 4 Hodgkin’s Lymphoma, a form of cancer. I was very upset and shocked by this. I thought my life was over. The doctors told me my immune system would be compromised and that I wouldn’t be able to have pets in the house. I had parrots and I had to give them up. It was really hard for me. I missed them, hearing them talk and their comical antics. A sponsor named Maureen from The Make-A-Wish Foundation came to my house and asked, “If you could have one wish, what would it be?” I immediately knew what I wanted. I wanted a bird again. But no ordinary bird, I wanted a Toco Toucan. Throughout my treatments all my thoughts were on the anticipation of getting the bird. My sponsor Maureen kept in touch with us on the birth of the bird and kept us updated on what was going on. 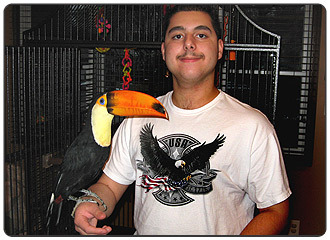 It made the discomfort of what I was going through bearable knowing that my Toco Toucan would eventually come. The People at Make-A-Wish contacted Jerry Jennings at Emerald Forest Bird Gardens in California, and immidiately went to work on making my unique wish become a reality. On November 2nd 2007. My 2 and a half month Toco Toucan flew in from California. I was ecstatic when I saw him. I couldn’t believe he was here. He was absolutely beautiful. I named him Rocko. He has been living with us for 6 months and has brought me nothing but joy. Every time I hold him and play with him I think about the people who made my dream a reality for me. It is with great emotion and sincerity that I extend many grateful thanks to all the people at the Make a Wish Foundation of Suffolk County, New York for making my wish come true and especially all of the supporters whose generous contributions enable Mak- A-Wish to grant these wishes that bring such joy to children like myself that have a life threatening illness. The anticipation and granting of my wish certainly made a difference in how I coped with my illness. I would also like to extend my many thanks to Jerry Jennings and his Staff at Emerald Forest Bird Gardens for making my dream of owning one of the most beautiful exotic birds in the world a reality.